It is spring. Playoff time. Beards are unshaved. Underwear goes unchanged during winning streaks (or so I’m told). Orca whale flags bedeck cars, whose drivers toot and wave when passing fellow fanatics. Even the old Stick-in-Rink logo has made a comeback. An election campaign is conducted between hockey matches. To door knock during a game is to lose votes. Keep your Liberal red and your NDP blue and orange and your Green green. I’m wearing blue, green and white in support of Johnny Canuck, the lumberjack who wields his stick like an ax. Another symbol of this best-of-seven season is the release of Canucks tribute songs. The official sign at the entrance to Port McNeill on the northern end of Vancouver Island welcomes visitors to the “Gateway community to the Broughton Archipelago.” Another nearby sign better describes the blue-collar town as the hometown of Willie Mitchell. At Sunset Elementary school, his former alma mater, the children gathered after lunch to learn a new song. The lyrics were written by a Grade One teacher and the music arranged by a Grade Five teacher based on a hit song from 1961. It might not be Lennon-McCartney, but it tells the tale. “Willie is such an icon,” said Fran Jenkins, a teacher at the school for 20 years and a once-a-playoff lyrcist. “He’s a Port McNeill boy who’s living his dream. We’re trying to work with that to motivate the kids. A small display case is a shrine to the local boy who made good — well, at least made the Canucks. It includes photographs of Willie as a boy athlete at the school. The defenceman has donated plenty of caps and T-shirts and even autographed sweaters to the school. Each week, those among the school’s 200 students who have done their duty — such as showing appropriate behaviour and having completed homework reading assignments — get their name placed in a draw. Winners receive hockey cards and a gift certificate from a chain sandwich shop. They also get their photograph and name on a board reading Our Canuck Kids. Mr. Mitchell, 32, had yet to start school in the spring of 1982 when the Canucks enjoyed their first run deep into the playoffs. The Canucks wore orangey sweaters with a red-and-black chevron in those days, a Halloween uniform for playing a trick on the rest of the league by making the Stanley Cup finals. Their unexpected success led to the release of a 45-rpm (that’s “revolutions per minutes” for you youngsters out there) single on the Signet label. One side included a rendition of the novelty song, “Na Na Hey Hey Kiss Him Goodbye,” which crowds at the Pacific Coliseum belted out in the closing minute of a Canucks victory. 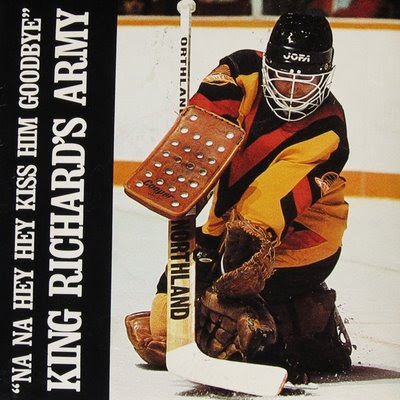 The flip side carried "King Richard,” a tune honouring goaltender Richard Brodeur, the highlight of which is an over-the-top voiceover praising “King Richard the Lionhearted” (sic). The tunes were belted out by soundtrucks when the Canucks arrived home after losing the opening games of the finals to the New York Islanders. The most dedicated of Canucks tunesmiths is the irrepressible Heavy Eric Holmquist, a prolific songwriter whose repertoire includes dozens of songs in honour of Canucks past and present. An homage to Todd Bertuzzi seven years ago managed to rhyme the hulking forward’s family name with woozy, Suzie, the watusi, not to mention local soccer legend Bob Lenarduzzi. I don’t think the Motown songwriting trio of Holland-Dozier-Holland could have done any better. The song was a doozy. He even has a Willie Mitchell song, just like the kids in Port McNeill, although Heavy Eric’s celebrates the defenceman’s prowess at fisticuffs among other scofflaw behaviours. Among these is the hilarious "Do the Luongo,” in which the Canucks goaltenders name is rhymed with Congo, bongo, and bucking bronco. For all his work, he says he has received a single royalty cheque for $32.46. “If I was doing this for money I would have quit years ago,” he admits. These days, any profits from downloads goes to a Canucks charity. Mr. Holmquist, 48, is a former postie and an Elvis performer. Before he took up music, he worked on a barnstorming logger-sports show with the father-son team of Jube and Fred Wickheim. He was a champion log roller and axe-thrower, sometimes dressing like a hillbilly lumberjack in jeans torn at the knees, suspenders, logger shirts and a toque, resembling a slightly less heroic Johnny Canuck. One of the highlights of his career as a birler was performing before 12,000 appreciative Swedes. He likes to think he’s still performing for appreciative Swedes, these ones sounding like a Stockholm law firm —Sedin, Sedin, Sundin, Ohlund, and Edler.